Israeli soldiers wore T-shirts with a pregnant woman in cross-hairs and the slogan "1 Shot 2 Kills," adding to a growing furor in the country over allegations of misconduct by troops during the Gaza war. "The smaller they are, the harder it is," says another shirt showing a child in a rifle sight. Soldiers wore the shirts to mark the end of basic training and other military courses and they were first reported by the Haaretz daily. The military condemned the soldiers involved, but it was not immediately clear how many wore the shirts. They were not manufactured or sanctioned by the military and appear not to have been widely distributed. 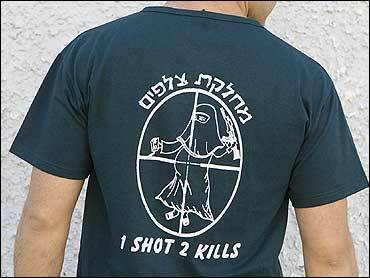 The shirts "are not in accordance with IDF values and are simply tasteless," the military said in a statement. "This type of humor is unbecoming and should be condemned." The army said it would not tolerate such behavior and would take disciplinary action against the soldiers involved. Haaretz showed pictures of five shirts and said they were made at the unit level - indicating that they were made for small numbers of troops, perhaps several dozen, at a time. It said they were worn by an unknown number of enlisted men in different units. The Tel Aviv factory that made many of the shirts, Adiv, refused to comment. Some of the shirts had blatant sexual messages. One battalion had a shirt made of a soldier standing next to a young woman with bruises, with the slogan, "Bet you got raped!" according to Haaretz. Others featured the phrase "Confirming the kill," a reference to the shooting an enemy in the head from close range to ensure he is dead, a practice that the IDF denies. Israel's military has come under increasing scrutiny after unidentified soldiers alleged that some troops opened fire hastily and killed Palestinian civilians during the Gaza war several months ago, including children, possibly because they believed they would not be held accountable under relaxed open-fire regulations. The military has ordered a criminal inquiry into soldiers accounts published in a military institute's newsletter. "I tell you that this is a moral and ideological army. I have no doubt that exceptional events will be dealt with," Ashkenazi told new recruits. Gaza "is a complex atmosphere that includes civilians, and we took every measure possible to reduce harm to the innocent." Palestinians too have glorified attacks on Israelis in the past. In the Gaza Strip, Hamas-controlled media consistently send messages that Jews cannot be trusted and that Israel is a bloodthirsty, militaristic state eager to seize Palestinian land and slaughter Palestinian children. The three-week Gaza offensive, launched to end years of rocket fire at Israeli towns, ended on Jan. 18. According to Palestinian officials, around 1,400 Palestinians were killed, most of them civilians. Thirteen Israelis died, three of them civilians.